My 4 year old told me she wished I could drive the other day. Luckily she was sitting behind me in her car seat so she did not see the tears spring to my eyes. My response was just "Me too honey." But the funny thing is that the reason she said it at the time had nothing to do with the inconvenience of finding rides everywhere and that sort of thing. It was because we were waiting in the parking lot of a grocery store while my husband ran in to get a few things and she was BORED. She wanted to ride around the parking lot instead of just sitting in one spot! Apparently the seven minutes we had to wait was torture! Tonight she said something about driving and when I reminded her that I cannot drive she said "Yes you can! You can drive my jeep!" Which is true. I have hopped on her jeep and driven it on the driveway although I am sure I exceed the weight limit. After that she said that I should wear glasses. I told her they do not work for me and she asked me if I could see around the room we were in. I said yes and of course that made her wonder why my eyes are not good enough to drive. She is an extremely bright kid and I can tell she is trying to make sense of my vision. Which is not easy to do even for adults! She and my 2 year old now each have their own battery operated vehicles that they ride around in. Thanks to some wonderful family friends who gave us their old Jeep! Alexis knows how to make a three point turn thanks to my husband. It is amazing! She loves to drive up our long driveway to get the mail and drive back down the hill. Of course I walk along with her when she does this! Ayla likes to ride with her big sister and take control of the radio. I do not want to think this far ahead but I can't help picturing them as teens doing this! I hope they stay as close as they are now. So I know that I am doing my best and that they are learning and developing right on track or better. But I can't help feel like my not being able to drive is hindering them now and will so more and more as they get older. I am very lucky to have my family so close and I am eternally grateful for all of their help. I feel like I have been getting better about pushing these fears to the side while I enjoy every minute with these cuties! But when these questions come up, or in certain situations, I can't help but feel some sadness. 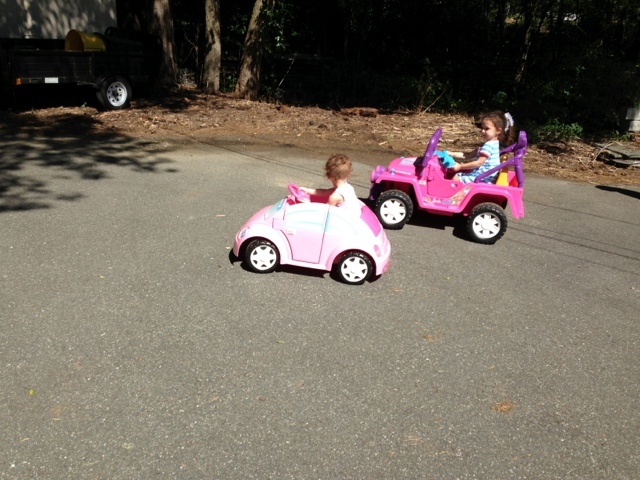 Now check out these cuties cruising around in their pink cars! Heather you are a strong mom and a great mom. Don't ever doubt that. It's only normal that as a parent we feel like we want to do it all, well sometimes for whatever reason it may be, we just can't. When Alexis asks you a question as 4 year olds ask many, many questions...it's great that you have that conversation with her. Little minds are always thinking. How great is it that you were riding around in her jeep! You are the COOL mom and that's the kind of thing that is important. She cherishes moments like that more than if you were able to drive her around the parking lot. Her and Ayla will always be close. They are both thriving in a loving home with parents that love them and that is what is important. Don't sweat the little stuff, because each and every day you are doing alot of the "big stuff" that to you may not seem like it, but in their eyes you are. Give yourself a pat on the back because you sure do deserve one. Thank you, Diana. Couldn't have said it by myself.heather is a cool, fun Mom. One of the best I've ever seen. But this is a huge issue for her. She somehow feels like she is failing her kids by not being able to pop them in the car to take them places. She can feel stuck in her house all day. We all know that feeling. But for Heather this is real. Yet, She makes sure the kids get out to play. Their backyard is like a playground. She takes them for walks, which they love because it usually ends up at another playground! I have seen her tear up because of this issue and it breaks my heart. She feels as if she is not doing enough. Her eyes even make deciding which Kindergarten Alexis will go to a difficult decision. Does she want to send her to the school that has Spanish or to the closest school so that she has complete access ability? She's wanting to put Ayla in a little program....does that mean she has to yet again ask someone to get her there and back? (As if that someone would not love to do it!). But that is not the point. The point is for an independent woman she feels dependent. And she absolutely hates that. Her kids are happy, brilliant, fun loving, silly, kids. They are a joy to be around. How did they get that way? Heather...Chip too. But Heather is teaching the not only that life is Fun, which I love, but also that when thrown a curve ball you CAN adjust. You can go on and live a fun fulfilling live. You just have to make it work no matter how difficult. And Heather does. Proud is a weak word to describe how her Dad and I feel about Heather. She is amazing. In October we are doing a walk for vision. She will never stop helping to find a cure. Persistence. Drive. But most of all a love of life......what more can you teach your kids? god bless you, Heather. We love you mints. Keep writing. It is good for us all. Your ever loving, Ma...my precious Sweetheart. This is the second comment I wrote. I liked the first one better. But the blog would not take it. I think people are having trouble writing on this blog:( I love you, precious. Thank you Diana! You are so sweet! I appreciate your support and kind words! Jamie is a lucky girl to be joining your family! Mom, What you wrote was wonderful. You definitely "get me"...more than I realize sometimes. I hope so, Honey. I am glad you liked what I wrote. Very personal. But, this is the place to be honest. Wish I had a magic wand. Love you mints, my Sweetheart. Keep writing! Wow, this is a great post! Don't worry too much about not driving, it is much more important for your girls to have a great mom than a mom who can drive!!! Also, please call us if you ever want an evening ride to get groceries, Target, etc. as I am always more than happy to do this and we always need stuff too! I am embarrassed to admit that it has taken me this long to read your blog. I am so sorry! It takes enormous courage and maturity to have dealt with and continue to deal with and handle the challenges you face. And HANDLE it you do and do it so well that I almost always forget that you live with a visual impairment! And it takes even more courage and energy to share your experiences with all and I want to thank you for sharing! I have only read a few of your posts but you have already brought me to tears.... Tears of sadness but ultimately of joy to see you succeed at everything you do in life. You communicate in a way that everyone can relate to, even if their challenge is not a visual impairment. Your Back to School post flashed me back to our one year together in high school and how oblivious I was to what you were dealing with, how well adjusted you were and obviously still are. Your Back to School post also made me think about my little April and the challenges she faces now and may continue to face as she moves forward in school and life. It reminds me that I must continue to be her biggest and greatest advocate just as Mama Gangi was and continues to be for you. I am so proud of you my chickie!!! I LOVE YOU! :) Muuuuuuuuuuuuuuuuuuuuuuu! BTW- Mama Gangi! You are amazing! You are wonderful beyond words! I love you! Kerry, you are an amazing friend. Thank you! I will take you up on that sometime! You are such an awesome friend to me and I am glad you forget that I have a visual impairment! You are a fabulous mom and you are already being an advocate for April. She is doing so well because of all you have done for her! She is a lucky girl...and she is a doll! Debbie, you are and always have been a great friend to Heather. It must be wonderful for her to hang out with you and the last thing on your mind his her visual impairment. It does not define her. You get that. Thank you for your kind words about me. You are so sweet. But, Heather is right....you are a great Mom! Both of you are. Kerry and Shauna, too. Heather has some pretty awesome friends. Love ya mints, Chickie! Walk, Give, or Shop for Sight!